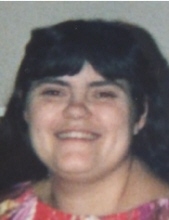 Mrs. Mary Mae Kinney Johnson, age 53, of Maysville, Kentucky, passed away Friday, April 12, 2019, at Meadowview Regional Medical Center in Maysville, Kentucky. She was born May 24, 1965, in Lewis County, Kentucky, the daughter of the late Bruce Lee and Betty Ginn Kinney. In addition to her parents, she is preceded in death by one half sister, Robin Lynn Kinney. Mary is survived by two daughters, Teresa Clark of Maysville, Kentucky and Sheila Johnson of Lexington, Kentucky; two grandchildren, Adam Clark Jr. and Lisa Clark; and two brothers, Eugene Kinney and Patrick Kinney both of Vanceburg, Kentucky. She also leaves many other family members and friends who will sadly miss her. Funeral services will be held at 7 p.m. Saturday, April 20, 2019 at Dickerson Funeral Home in Vanceburg, Kentucky with Brother Arthur Moore officiating. Burial will be in the Our Lady Of Lords Cemetery on Salt Lick Road in Vanceburg, Kentucky. Friends may visit from 6 p.m. to 7 p.m. Saturday, April 20, 2019 at Dickerson Funeral Home, 110 West Second Street, Vanceburg, Kentucky 41179. "Email Address" would like to share the life celebration of Mary Mae Kinney Johnson. Click on the "link" to go to share a favorite memory or leave a condolence message for the family.